As our kissin’ cousins at Two-Daily Town noted the other day, newspapers are falling all over themselves trying to convince the American public that the press actually matters in a very real way. It started with the Washington Post pasting this slogan under its banner on Page One. New York Times editor Dean Baquet responded that “Democracy Dies in Darkness” would make a great title for the next Batman movie. And that was one of the kinder comments it drew. 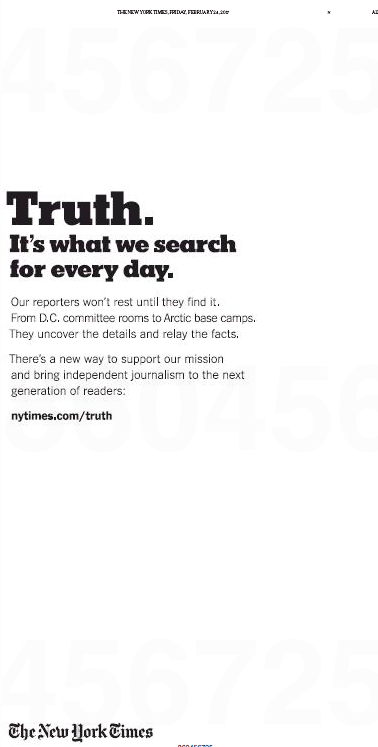 Next up was the New York Times with this full-page ad. The Times also ran this ad during the Academy Awards broadcast. 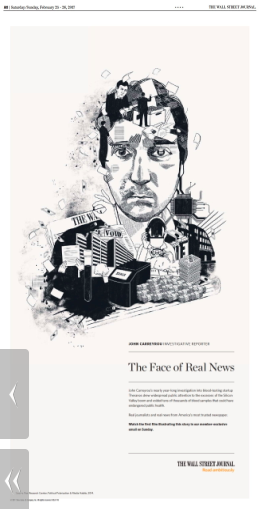 Then came the Wall Street Journal’s The Face of Real News campaign. 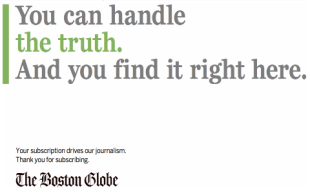 Locally, the Boston Globe started posting mini-manifestos at the top of its homepage last week. The Globe also launched a series of ads like this one. 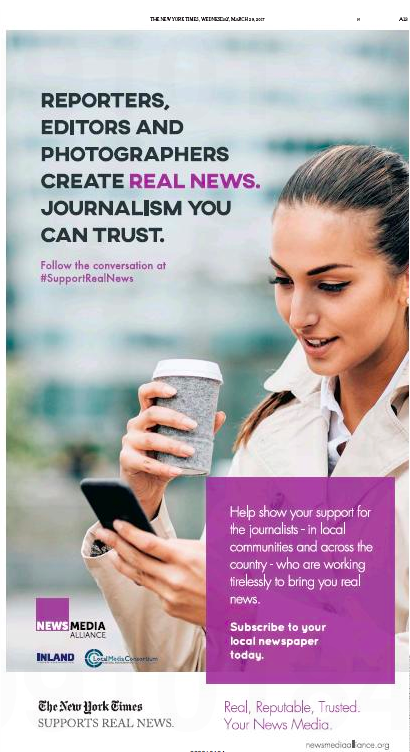 The News Media Alliance has also weighed in with this ad in the Times and the Journal. Now, coming full circle, the Grey Lady has installed this at the bottom of its webpages. This entry was posted in Uncategorized and tagged Boston Globe, Boston Herald, Dean Baquet, Democracy Dies in Darkness, Grey Lady, John Carreyrou, News Media Alliance, Pep Squad for Truth, t-shirts, The Face of Real News, Two-Daily Town, Wall Street Journal, Washington Post. Bookmark the permalink.